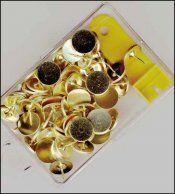 Brass Thumbtacks & Remover  - $3.00 : Yarn Tree, Your wholesale source for cross stitch supplies. Item 2773. Brass Thumbtacks & Remover. Non-rusting brass thumbtacks are great for using on stretcher bars. The remover will help protect your fingernails when taking the thumbtacks off the stretchers. About 60 tacks per box.